Sergio Konstanza, a Swindler, owes money to Mr. Hasson. He escapes to the desert where he joins a wacky army reserve unit whose Sergeant is engaged to one of Mr. Hasson's Daughters. When ancient Sodom is doomed to destruction due to its people's corrupt ways, Lot is the only righteous man destined to be spared. 3 middle aged men in a conflict with life about their wives, friends, children and funny everyday situations . The story of a group of Israeli soldiers stationed in an outpost prior to the withdrawal of forces of 2000. 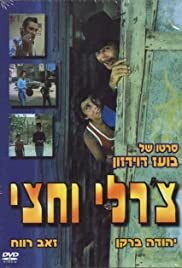 Charlie Ve'hetzi is sort of a cult film in Israel, for its portrayal of working class Israeli Jews from Arab countries. Working class isn't the exact term, because the main character, Charlie, lets his mother support him while he keeps the money he makes by cheating suckers with a three card scam. Hetzi is a street kid who would rather spend the day with Charlie than go to school (his put upon sister who is raising him isn't having a lot of success). Charlie has managed to get himself a very rich, fantasy type rich, blonde girlfriend of European roots, and he's portrayed as a great guy, while all the European Jews are vicious exploiters. It's a very odd film because it sends messages in all directions. Women come off very badly -- Hetzi's sister is harassed by her employer (I think it's a factory) but this is shown as a matter of fact, not as anything particularly wrong. Charlie's girlfriend is a real valley girl type, his mother serves him with a, "well, he's my boy" kind of attitude. The film is widely discussed in film and ethnic studies here.